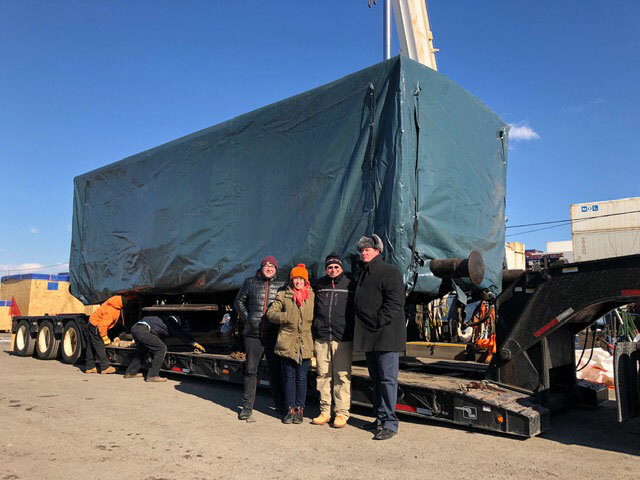 In nearly 40 years of involvement in logistics, almost all of it in the field of fine art transportation, participating in this move was professionally the most significant, and personally the most emotional, project I have ever undertaken. 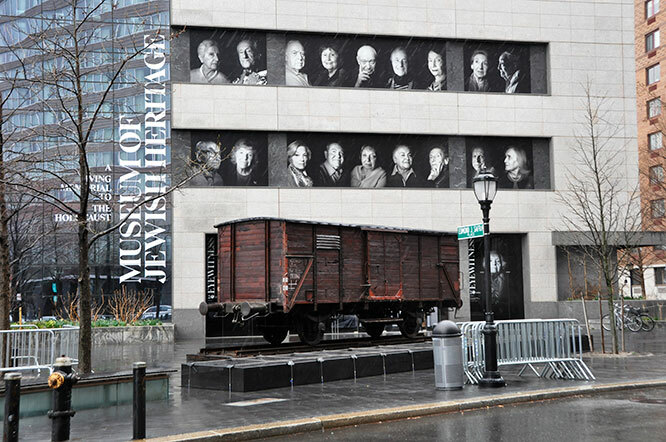 The rail car is on loan from Musealia, to an exhibition services company in Spain, which is co-sponsoring the new exhibition, “Auschwitz: Not Long Ago, Not Far Away,” with the Museum of Jewish Heritage. Thus, the railcar was shipped from Valencia to Port Newark on a container ship, after the close of the exhibition in Spain. Our agent in Europe organized the export formalities and ocean transport. 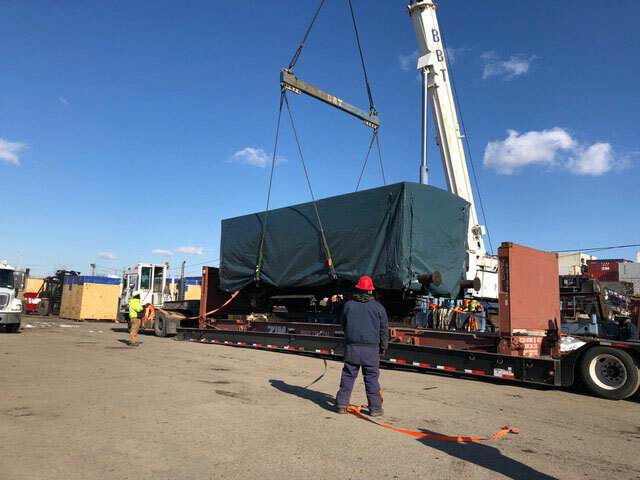 The railcar was moved on what is known as a “flat rack container” (meaning it has no side sides), because it was too large to fit within the standard, 40-foot unit that is typical on cargo vessels. Due to the importance and fragility of the railcar, special dispensation was made to carry the flat rack container “below deck” on the container ship, in order to limit its exposure to the elements during transit, which took approximately 15 days on the open seas. Once the ship arrived at Port Newark, we began the U.S. Customs clearance procedure. Next, we organized the domestic transport logistics from the port to the museum, along with the on-site installation process, in partnership with a Marshall Fine Arts, a company that specializes in the rigging and installation of large-scale artwork around the country. Their expertise and knowledge were critically important for the safe handling of the railcar. 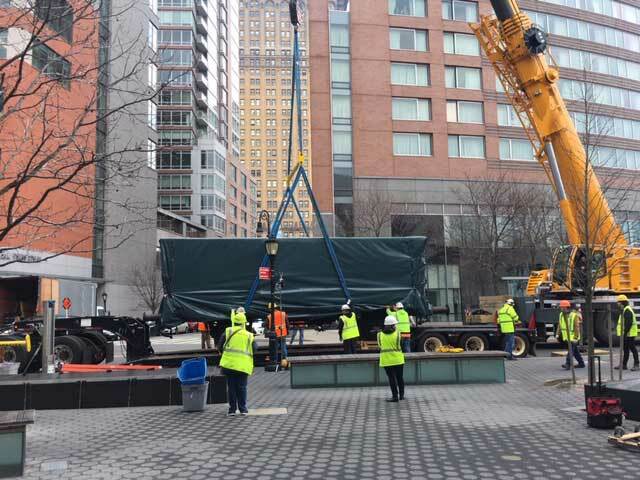 The result of months of planning for this move are now on view outside of the Museum of Jewish Heritage. There are also many additional artifacts on loan for the “Auschwitz: Not Long Ago, Not Far Away” exhibition. They include uniforms worn by Jewish prisoners at Auschwitz, their personal belongings, original artifact barracks, and other melancholy reminders from one of the darkest chapters in human history. But such dreams take time, and there wasn’t time enough for my grandfather’s relatives who remained in Lithuania. In June, 1941, Nazi tanks rolled into Vilnius. Within 72 hours, the newly arrived German occupiers began organizing pogroms, in which dozens, then hundreds of Lithuanian Jews were massacred in the streets. Before a week had passed, the death toll climbed into the thousands. And this was before the mechanized, assembly-line murder that is recalled by “Auschwitz: Not Long Ago, Not Far Away” got under way. In the 1,316 days that the Germans occupied Lithuania, more than 90 percent of the country’s prewar Jewish population of more than 200,000 would be murdered. In proportional terms, this is a higher death toll than was suffered by any other nation in which the Holocaust was perpetrated. Sadly, many of my grandfather’s family were among those victims. My grandfather was one of the lucky ones. As a third-generation immigrant, I reflect each morning on how fortunate I am, when I look out my window to the Statue of Liberty and Ellis Island. When I do these things, I remember my grandfather, hoping that he would be proud of me and what I have accomplished. I also remember that none of this would have been possible without his sacrifices. But now, my debt of gratitude, the solace and solidarity I share with my family, as well with the relatives of six million others, have all found a new focal point. It is the rail car that was once used to deliver countless, nameless victims to their cruel fate, but now serves as an eloquent attestation to our shared resolve never to forget, and never to allow this crime to be repeated. I am awed that this relic sits a few steps from my home. And I am deeply honored that I helped put it there. I haven’t seen the railway car yet. I’m afraid it will be too emotional for me. Just thinking about this horrible crime that was inflicted on the Jewish people is shocking and unforgivable. My family also came to America looking for a better life. We were lucky to find it. The people that died on this rail car never had a chance. Thanks for bringing this evidence to remind us what can happen under a corrupt regime. And your telling of the story, of the stories, of your story, is poignant in a deep and heartfelt way.